Oh Snap! I just came across the iRetrofone--a new fully functional way of storing, charging, and talking on your iPhone with a vintage twist. I mean, how genius is this design from Freeland Studios?! Love it! It's almost nostalgic to see rotary phones now, and I for one prefer this silhouette over some of the sleeker devices on the market. If you ask me, nothing compares to the classics--and this design is the perfect mix of retro meets modern. 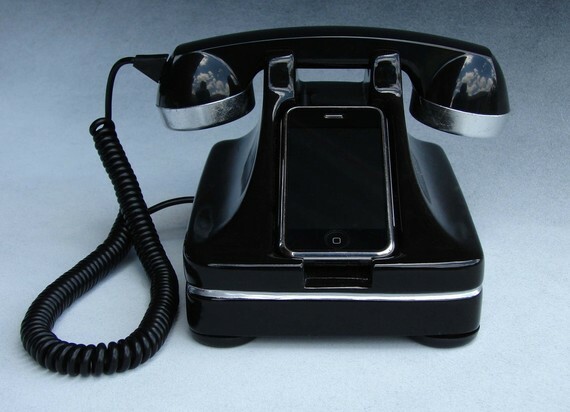 The iRetrofone is a stationary iPhone dock with working handset and complete compatibility with USB cable. Each individual iRetrofone is hand-sculpted and hand-cast in urethane resin. 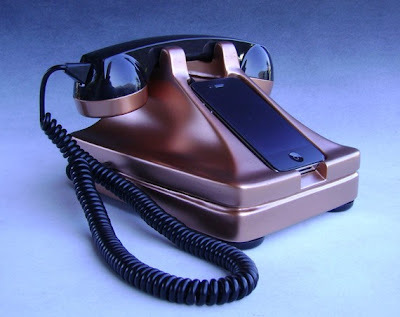 The iRetrofone is made of heavy-duty, half-inch thick urethane resin creating a stable, functional work station that routes voice communications through the included handset. Designed to be compatible with all iPhone's (iPhone 3G, 3GS & iPhone 4G), it accommodates sync and charge functions via a USB cable (not included). The iRetrofone base also helps eliminate concerns about radiation. And although the phones may look retro--they don't come with retro prices, folks. They're available in several designs but range from $195-$350.